The beauty of living in the woods is the cute little furry friends that come to visit. We've seen this bunny every day for the past few weeks. I'm pretty sure he is living under the shed. Over the weekend I got some pictures of him hanging in the kids playhouse. Great photos! How often can you see a bunny inside the playhouse?! Very cute! How cute!! I adore bunnies. I love the one of the bunny in the playhouse. I love bunnies. I used to have one! What great pictures!! I always wanted a rabbit but Hubby says no more small animals. Aww...he is so cute! Not so cute to your flowers probably! ;) Happy WW to ya! The bunny inside the playhouse is sooo cute! Great shots! Love how you captured the bunny in the playhouse. Adorable. Awww I just love bunnies! That's so cute he's hanging out in the playhouse. Sweet! I love the little guy looking out from the playhouse. So cute! You caught some really good photos of your little friend. Awwww, he's cute. Looks like he's moving in! Great photos. 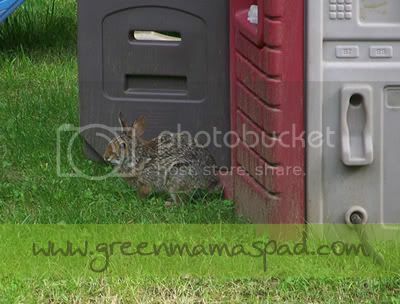 We live in Baltimore, Maryland and see about 10 rabbits a day in our little yard. Crazy! It went right in the playhouse? That's so funny! 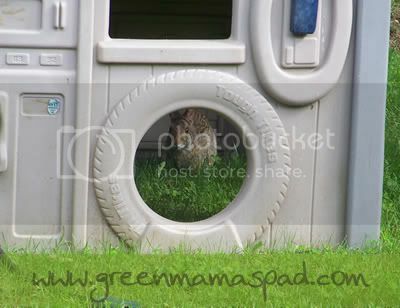 I love the photo of the bunny in the playhouse great shots! this is so funny to me because we too have a bunny living under our shed, in fact I think we have a whole family of them! We have tons of bunnies in our yard too. They startle me when I go to take out the garbage and they run off. 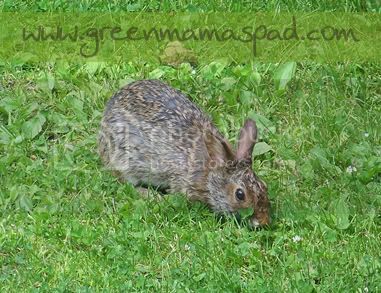 Cute, we have some baby bunnies hopping around in my wildflower garden, they let you get so close! That is adorable!! We have a squirel family living in the tree we have in our backyard. how cute!! I love bunnies too!!! Awww, how cute. We had deer in our backyard once and we live in suburbia, lol. Those are awesome! I love the one inside the playhouse the best! he is such a cutie!!!!!!!! I love the one through the tire! Too Cute!! I love rabbits. How precious!! Thanks for sharing and I hope you have a lovely day. Hi Marianna, I guess the bunny left you speechless or wordless rather. How nice to see these gentle creatures slowly creep up and try to make friends with us. He must have been watching you for quite sometime before deciding that it’s a friendly home to pitch in. Wise little thing! Please, visit http://climatarians.org to find related interesting topics.